Jesus wanted His followers to make an IMPACT in the world, and to this end He exhorted His disciples using two metaphors: SALT and LIGHT. You are the salt of the earth. But if the salt loses its saltiness, how can it be made salty again? It is no longer good for anything, except to be thrown out and trampled by men. (Matthew 5:13). In the ancient world salt was a hugely valuable commodity. Historians have suggested that, in Jesus’ day, Roman soldiers were paid (at least in part) with salt. The value of salt essentially comes from two qualities: 1) Salt preserves, and 2) Salt flavours. Thinking of the first characteristic, followers of Jesus should exert an influence that preserves godly standards within a context that is threatened by moral or spiritual decay. Unfortunately, some followers—some churches have sought to preserve from a distance. Christians have sometimes reduced their preserving influence to shouts of protest and political maneuvering. But if we stick with the metaphor we remember that salt preserves by attaching to the thing it is meant to keep from decay. I reckon that our ‘saltiness’ is our Christ-likeness. Attaching to the world then is not becoming like the world. Rather, our close proximity to the world is for the express purpose of sprinkling on Christ-likeness. This cannot be done at arms length. Salt not only preserves, but it adds flavour. Salt improves the taste of food—it adds value. Translation: followers of Jesus should ‘add value’ to this world. The world should be a better place because of the influence—because of the flavouring that comes from the Church. Wouldn’t it be great if we could measure this? Wouldn’t it be great if there was a way to determine whether our ‘saltiness’ was helping to preserve and/or add flavour? I think there is. 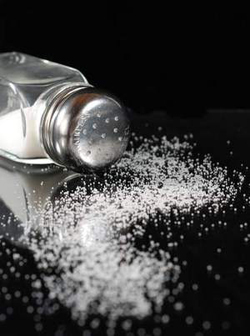 I think we can measure our saltiness by thinking about another characteristic of salt. What happens when you eat a bag of salted potato chips? What happens when you eat a bag of salted popcorn? I would maintain that when followers of Jesus are salty, and when followers of Jesus attach themselves to others, it makes those around them thirsty for Jesus. That’s the IMPACT I’m aiming at. I’m not interested in force feeding ‘living water’ to those around me. If I can succeed in being salty, then I expect I will succeed at making others thirsty for what Christ offers. Have a listen to the audio message on this subject—delivered at St. Giles Kingsway and The Well on Sunday, March 8.